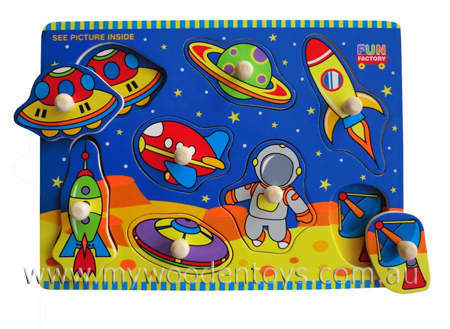 Astronaut Space Wooden Knob Puzzle is a lovely colourful wooden puzzle depicting a fantasy journey into space with rockets, planets and a floating astronaut. The eight removable shapes with knobs are nice and easy for small fingers to grab. When you remove the shape there is a corresponding picture underneath so you can take them out and then match them all up again. This is a brilliant puzzle for little children who are just learning about shapes and matching. The images are painted directly onto the wood so there is no paper to peel off. Material: Wood with child-safe paint. We like this because: "A simple, classic puzzle with a lovely space theme." I'm just letting you know I received my order yesterday, and thanks to great packaging everything arrived in good order. Thank you.